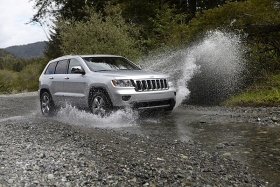 Initial orders for the 2011 Jeep Grand Cherokee are 30-40 percent higher than initial expectations, Chrysler says. DETROIT -- Dealer orders for the redesigned 2011 Jeep Grand Cherokee have exceeded expectations by about a third -- a key factor in Chrysler Group's decision to add a second shift to its Jefferson North Assembly Plant here. Chrysler will hire an additional 1,080 workers for the second shift, which starts July 19, CEO Sergio Marchionne said today at the production launch ceremony for the vehicle. The plant already employs 1,700. “Initial orders are 30-40 percent higher than initial expectations,” Jeep brand CEO Michael Manley said on the sidelines at the ceremony. Chrysler declined to say what their volume expectations were for the vehicle. Jeep sold 50,328 Grand Cherokees in 2009, down 32 percent from the previous year. Sales have declined along with sales in the SUV segment in general. In 1999, Grand Cherokee sales peaked at 300,031. Chrysler will begin building another vehicle at the factory in the fourth quarter. The vehicle will carry the Dodge brand, will have seven seats and will replace the Durango SUV in the Dodge lineup. The Grand Cherokee has five seats. Chrysler has invested $686 million in the Grand Cherokee program, including a new body shop. Marchionne hailed the 2011 Grand Cherokee as "the rebirth of the Chrysler Group." He drew a standing ovation from assembled workers and dignitaries at the plant. The Italian-Canadian executive made a dramatic entrance to the factory ceremony, driving a silver Grand Cherokee to the front of the stage with Michigan Gov. Jennifer Granholm as a passenger. Although the Grand Cherokee program was already in the works when Fiat took management control of Chrysler, Fiat S.p.A. already has brought major changes to Chrysler's manufacturing culture. Employees at the plant have received 44,000 hours of training in Chrysler's World Class Manufacturing process, developed by Fiat as a version of Toyota's lean manufacturing system. Marchionne said the system "is intended to put dignity into the workplace" by giving workers a greater role in shaping their jobs. "The workplace should be a place that you can be proud of, that you can take your kids to and show them where you work, and that will reflect fundamental values of human self-respect," he said. "That's why WCM is such an agent of change." Among the innovations Fiat has brought is a gauge called the Meisterbock, which allows Chrysler engineers to closely measure tolerances to see how parts will go together in the body shop before they go onto the line. "We found some parts that were out of conformation and had suppliers take them back to the drawing board," said Trajche Sekuloski, a plant employee. Chrysler couldn't have anticipated these problems previously, he said. Jeep wants the Grand Cherokee to move upscale in every area but price. The premium Overland version will sell for $42,995, including shipping. Chrysler is launching the vehicle in three models: Overland, Limited and Laredo. The company is following its recent policy of offering more features at a slightly lower price than the previous model. The Overland features wood and leather accents geared to the luxury segment, including a wood-trimmed steering wheel. Two engine options will be offered. The new Grand Cherokee will be the first Chrysler vehicle to come with the company's 3.6-liter V-6 Pentastar engine, which will crank out 290 hp. With the V-6, the four-wheel-drive version gets 23 mpg and has a 500-mile cruising range. Phil Jansen, chief engineer on the program, said Chrysler anticipates that 75 percent of all Grand Cherokees will be sold with the V-6, up from 60 to 65 percent with the current model. The current Grand Cherokee V-6 only generates 210 hp. Also offered will be a Hemi V-8. Both engines are mated to existing five-speed automatic transmissions. The Grand Cherokee started development when Daimler still owned Chrysler Group. It shares components with the Mercedes-Benz M class. Jansen said the Grand Cherokee shares suspension components and a steering column with the Mercedes models. But the Jeep features a suite of new off-road systems that are completely different, including a QuadraLift suspension that allows the driver to adjust the height of the body depending on conditions. "What they [Mercedes] want to do and what we want to do is totally different based on our brand" regarding off-road capability, Jansen said. For the first time, the Grand Cherokee has independent front- and rear axles for better on-road performance, Jansen said. The Grand Cherokee was designed so it could pass emissions and safety regulations around the world. The vehicle will be sold in 105 countries, Jansen said. Right-hand-drive versions will go into production this year. Chrysler plans to make all Grand Cherokee models in Detroit. In the past, the company manufactured European versions at a factory in Graz, Austria.